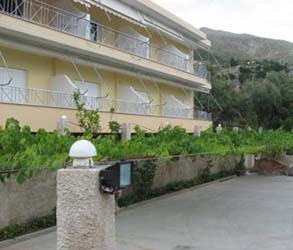 Apartments Martino are located by the secondary road which conects the Main National road to the South Albania and the beach of Dhermi. It is 500 m far from the sea. The secondary road is asphalted this year, whic makes it very easy to reach the beach by walking or driving. There are 10 Apartments facing the sea. Each apartment has double bed and tow floor bed which is suitable for families with 2 childrean. Each apartment has kitchen facilities, and refrigerator, toilets with shower and balcony. There is also a private parking for the guests of the hotel. pas ketij afati, atehere klientit i mbahet e gjithe shuma e nates se pare te akomodimit. hotelit.Gjate kohes se checkinit do tju kerkohen mjet identifikimi me foto si dhe karta e kreditit apo para kesh.